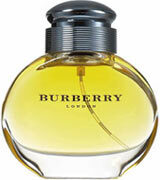 Burberrys was created by Burberrys in 1995 and is recommended for daytime wear. This feminine scent possesses a floral top of lavender, a blend of peach, apricot, sandalwood, cedar, amber and musk. This delicate composition reaches its pinnacle in the heady seduction of vanilla and cedarwood, underlining the presence of today’s woman in all her touching complexity. Notes include: Cassis, Dewberry, Pink Peppercorn, Californian Orange, Rose Oil, Jasmine, Raspberry, Peach, Madonna Lily, Tuberose, Cedarwood, Vanilla, and Oakmoss.